‘Harness’ing the power of the Bungee…… a new and fun way to stay fit? First hitting the scene last summer when it’s taster video went viral, bungee fitness has spread like wild fire. Originating in Bangkok, Thailand it is sweeping across the US, UK and Australia. It has now finally arrived in Europe, and is showing no signs of slowing down. One of the hardest things about fitness training is ensuring your workouts stay innovative, targeted and fun. Standing on a treadmill 3 times a week can quickly get monotonous and makes the whole process of staying fit harder and quite uninspiring. Enter Bungee fitness, a revolutionary training methodology that is fun in large measures. This gravity defying workout will have you grinning from ear to ear as you glide, bounce and soar around the room. The best thing about it is, you will be having so much fun you won’t even realise how much work it is until your heart rate is pumping and you are left dripping in sweat! It starts with you being fastened into a harness which is then attached to a bungee cord descending from the ceiling. From here, you will perform various acrobatic manoeuvres, ones which you’d never think you’d be able to perform without the safety of the bungee cord. 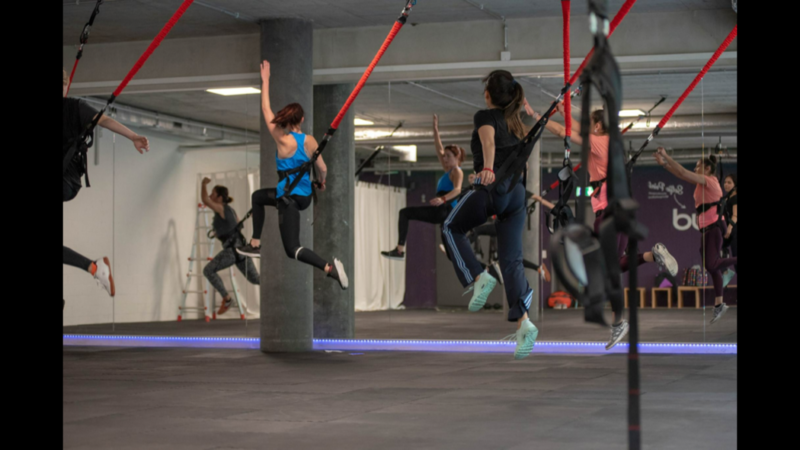 One handed planks, cartwheels, dives and even one handed handstands are all just examples of the sheer diversity that can be incorporated into Bungee Fitness. And what a killer on the core!! Bungee workouts really target the transverse abdominals, an area that a lot of workouts neglect. As well as being a highly effective way of burning calories and building muscle, exercising on the Bungee will also improve your movements and flexibility by taking the impact out of your leaps and bounds so your joints don’t absorb the shock; allowing you to move more skilfully as you fly around the room. My personal favourite is ‘Bungee Tabata’. Tabata is a form of exercise created by Japanese scientist Dr. Izumi Tabata and is a high-intensity interval training (HIIT) workout, featuring exercise routines that last four minutes*. Performing Tabata on the Bungee allows you to be more creative with your movements while you’re working out to your max during the 20 second active period: running, jumping, spinning and diving through the air. I have been leading Bungee Fitness classes for the last month now and one of the most rewarding parts of the workout is seeing how the ropes bring out the child-like nature in all the people that I have trained so far. I have seen people of all ages and abilities throw themselves into this workout and come out wanting more. You can check out our classes and packages via the bungee-fit.ch website. Click on the link and take your first leap into the world of bungee fitness. © Copyright - mbodypt 2017 All rights reserved.